The British Championship returns to Owlerton Stadium, Sheffield on Sunday 4 June for the first time since 2005. 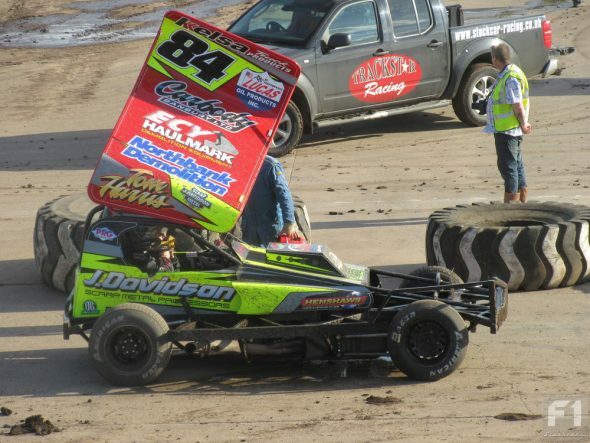 Originally scheduled for the much-missed Coventry Stadium, the transfer to the South Yorkshire venue may have an effect on car numbers, especially with meetings at King’s Lynn and Belle Vue over last weekend but should hopefully raise enough drivers for the now traditional “British” format of several heats followed by the big final. Defending champion Frankie Wainman Junior (1) took the title at a damp Skegness last year for the eighth time, two of those eight victories coming at Sheffield in 2004 and 2005 but Frankie’s form this season has been frustrating for the army of FWJ supporters with just one heat win to his credit so far. Most 2017 shale races have seen Frankie facing the way he came at some point, either through over exuberance or other drivers actions but, that said, until last weekend he was second in the grading points so his determination to succeed is not in doubt and he won’t be letting the black and white chequered roof go without a fight. Paul Harrison (2) and Dan Johnson (4) are both capable of lifting the title at Sheffield, in fact Paul won his first British way back in 1991 at Buxton. Equally at home on shale or tarmac, the youthful Rotherham veteran may be thinking of winding down his career but could still have a championship or two in him yet. Dan also has the skill and machinery to take the British and did not race at either of last weekend’s meetings so is he saving himself for Sheffield? 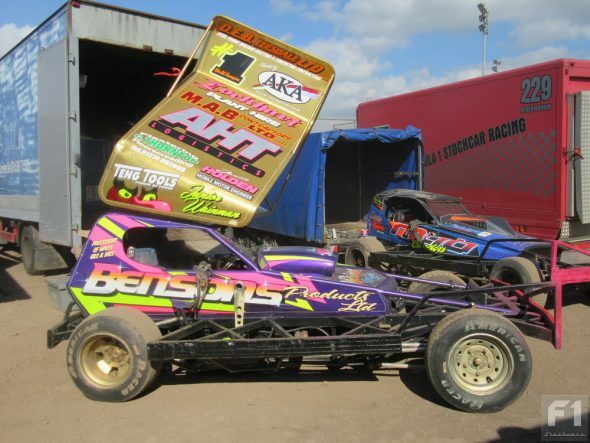 Dan blew his tarmac car and rolled a “loaner” at the recent Skegness UK Open so a change of luck would be welcome. Mat Newson (16) could be one to watch. He won the April Sheffield at the wheel of the loaned Mark Sargent car and netted a heat and GN win at Belle Vue yesterday so is certainly in form. He is also long overdue for a title win and victory in the British would be just rewards for one of the hardest working men in Briscaland. I just wonder if, when push comes to shove, he has the mean streak required to do the business. Prove me wrong, Mat! 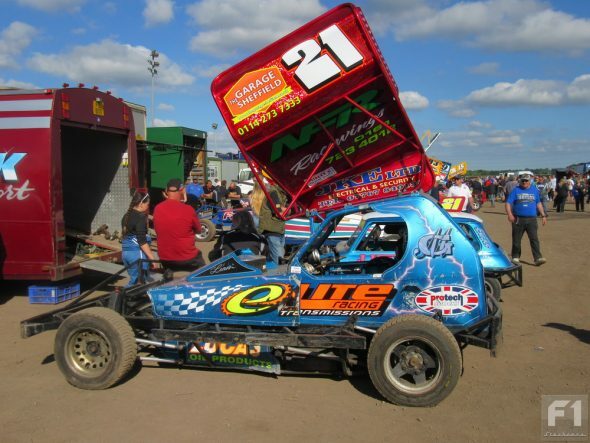 Mark Gilbank (21) is another who could spring a surprise at his local track. He may not race as much as he used to but he won the April ‘Lynn final by a mile and his venerable shale car is as quick as any. The British Championship is one title that has so far eluded Tom Harris (84) and he will doing his level best to put that right on Sunday. 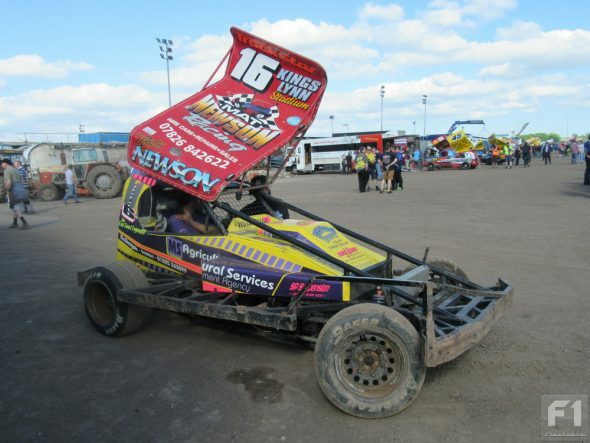 In top form at the moment, he was well on course for a heat and final double at King’s Lynn on Saturday until Ryan Harrison (197) intervened. If Ryan goes to Sheffield too, watch out fence! 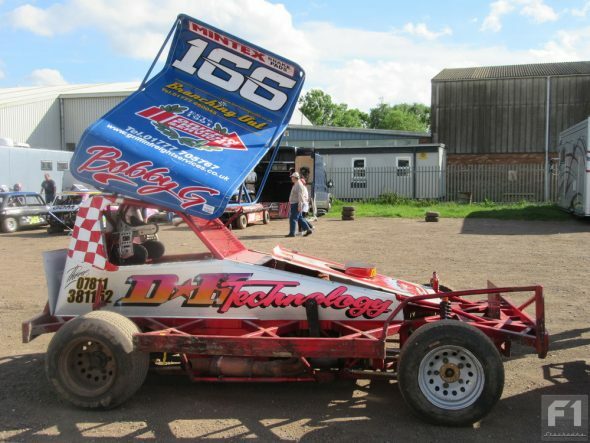 Craig Finnikin (55) has been there and done that and his shale car, with its unique rear suspension set up, is one of the best. Maybe a slow starter but as the track dries out watch the 55 car fly towards the front, or the fence – it all depends on who is behind him. 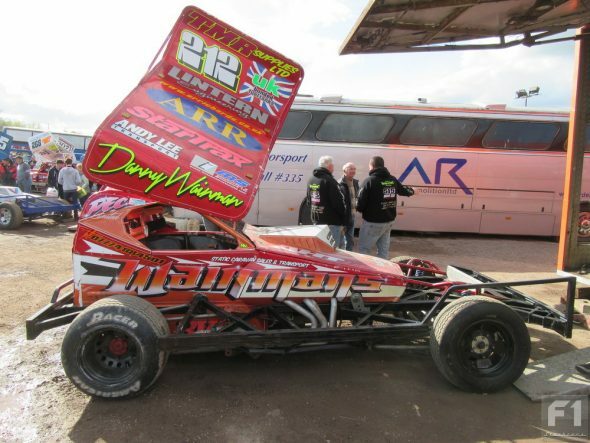 Talking of fences brings me to Danny Wainman (212). Danny made his F1 debut at the tight Sheffield circuit back in 2007 and probably rates it as his favourite track. It’s time for the former Under 25’s champion to raise his game and take a major title in 2017 – the British will do for starters. The last of my tips for the top is the man who is currently leading the points – Stuart Smith Junior (390). In scintillating form just about anywhere as a red top, the upgrading to superstar has not slowed him down at all. OK, so the April Sheffield did not go exactly to plan but I predict Stuart will be there or thereabouts come the drop of the chequered flag. Being named in this article is probably a curse on the driver concerned so I will avoid mentioning Nigel Green (445), who chalked up his third final win last Saturday! 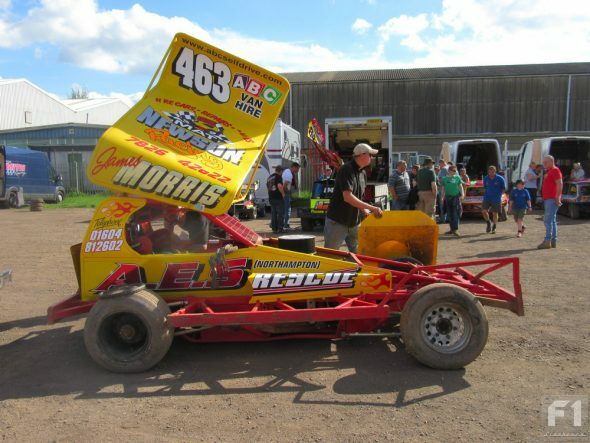 As for outside bets or dark horses for the title, how about James Morris (463). He has been going like a long dog, as the late Dave Lanning used to say, so far this season notching up heat wins here and there. If he is still a yellow top in the next regrading look to the Warrington man to be the lower grader who excels in the heats – there is always one. Up to yellow is ex-F2 racer John Wright (348) and here is a man who races old school – sh*t or bust is the expression that comes to mind and a joy to watch on track (and occasionally the centre green). Were he still similarly graded, I would expect the ever-smiling Bobby Griffin (166) to be in with a shot too but scoring well in the heats from blue top may go against him. Eliot Smith (293) is another one to watch in the qualifying races. “To be straight (and few of us are straight after working at Sheffield) we are worried. That first bend in the final will be chaos and we expect the worst. It’s no fun getting a wedgie in your u-bolts from a steel hawser, believe me. We’re hoping that Karl Roberts will stay clear of us now he’s a red top. And what about that Luke Dennis? A mate of mine transferred to the back straight last year, thought it might be safer – Dennis won the consolation, my mate took his eye off the 192 car for a moment and then wallop, straight in as that bloke on the telly says. My mate never worked as a fence post again, I can tell you. If you’re lucky, Old Frank might find a job for you at Belle Vue, or the Brickyard as we call it but if you are too far gone you are on the scrapheap, literally – probably at Jamie Davidson’s place”. Well, there you have it – what can’t speak, can’t lie.